As a creative photographer of engagement sessions in Los Angeles, I love when my couples have a sense of humor and are willing to play it up a bit for my camera during their engagement session. 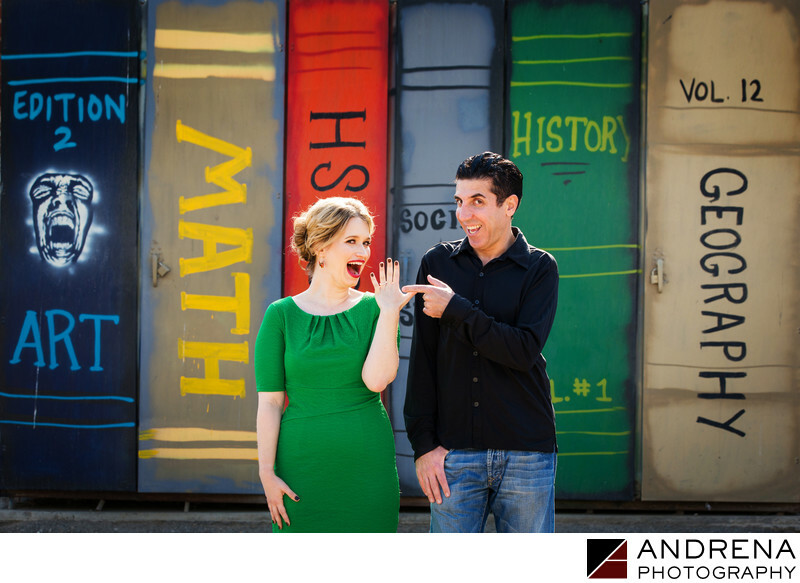 For this fun shot, taken against a painting of textbooks, the bride held up her ring to show it off, and I encouraged the groom to point at it in a funny way. The playfulness of this image makes it come alive, which is always the goal for any photographer. I love that I was able to use rim light provided courtesy an obliging sun, as the hair light provides great separation between my subjects and the background. I also love how the bride's green dress plays perfectly off the red/orange textbook art directly behind her, as well as off the kelly green textbook behind the groom's left shoulder. This couple was married in a Sephardic Orthodox Jewish ceremony at the Ritz-Carlton Laguna Niguel on a chilly winter day featuring clear skies and gorgeous sunshine. Photographed in Los Angeles, California.